Lung Cancer and Work—What Are Your Rights as an Employee? What do you need to know about lung cancer and your rights as an employee? What laws are in place to protect you and what reasonable accommodations can you expect? What are the pros and cons of working during lung cancer treatment? There are many fears and worries that arise with a diagnosis of cancer. Not only are you suddenly in a place in which you face your mortality up front and close, but you are left wondering how treating your cancer will affect the rest of your life. Will you be able to work? What happens to your health insurance if you can't work? The first point we want to make clear is that everyone is different, and only you can decide what is right for you. Some people are unable to work at all during cancer treatment or choose to leave the workplace to focus on their treatment. Others, in contrast, find that working offers a pleasant distraction from lung cancer treatment. Still others force themselves to work even if it is extremely difficult, fearing the financial repercussions if they should take a leave or quit. Your decision about working may seem overwhelming but can be made a bit easier by considering all of your options and asking yourself the tough questions. This is important even if you have already made a decision about your employment during treatment. Things can and do often change when you have cancer. Some people who decide they want to work will find it too difficult. Others may choose not to work, but later change their minds and return to work. If you decide to continue working, take the time to consider any special accommodations you will need. Also, review your sick leave policy and what you will need to do if you should decide to stop working for a time. Keep in mind that among those who choose to work during lung cancer treatment, cancer fatigue is one of the biggest stressors. Brainstorm ideas ahead of time for coping with your usual activities but less energy and check out these tips for coping with cancer fatigue before you find yourself exhausted. It's important to point out right away that what works for you as far as employment may differ from that of someone with another type of cancer, such as breast cancer. In fact, much of the information "out there" about working with cancer has been written for people with early stage breast cancer. With breast cancer, the majority of people are diagnosed in the early stages of the disease; the opposite is true for those with lung cancer. What this means is that people with lung cancer are often sicker than those with breast cancer. Rather than having been diagnosed with a mammogram or finding a painless breast lump, many people with lung cancer have been struggling with a persistent cough, shortness of breath, and often repeated lung infections for some time before the diagnosis is made. These symptoms can make working more difficult and the numbers appear to support that. People with breast cancer are much more likely to return to work after a leave than those with lung cancer. No matter how much you may want to work or how motivated you are, if you are having difficulty breathing, work can be difficult or impossible. How Often Can People Work During Lung Cancer Treatment? If you are feeling like you won't be able to work, learning about the statistics evaluating lung cancer and employment may help you feel less alone. We don’t have numbers telling us about people with advanced stage lung cancer, but we do for those with early stage lung cancer. A study done in 2014 looked at over 800 people who had lung cancer surgery (and potentially curable tumors.) 12 months after surgery these people were compared with a similar number of people without lung cancer. At the beginning of treatment, 68.6 percent of these people were employed, which dropped to 38.8 percent after treatment. Post-treatment unemployment was greater in women than in men. Inability to work was more common in those who were older, had other medical conditions, had a lower household income, or had poor social functioning. Of those who returned to work, the majority (78.6 percent) found that fatigue was their greatest work-related problem. This is not surprising since nearly everyone who goes through cancer treatment experiences some degree of cancer fatigue, and, for people who are long-term survivors, this can persist for several years. The elephant in the room is that choosing to stop working can be very difficult, or feel impossible financially. A 2016 study of several cancers combined found that 15 percent of people experienced financial hardship related to their cancer (and the guess is that this number is really much higher) and 25 percent reported that they continued to work due to concerns about losing medical insurance. The majority at 63 percent made changes in their jobs or careers (such as taking an extended leave) due to cancer and 42 percent found that cancer interfered with their tasks at work. Out of these cancers, those with lung cancer had more problems with employment and more concerns over finances. In order to make a decision about working during treatment, it's helpful to discuss some of the pros and cons others have noted in making the same decision. Keep in mind as you look at information discussing these pros and cons that much of the information available has been written for people with breast cancer rather than lung cancer. Without working you will have more time to care for yourself. Taking a leave or quitting your job can make it easier to schedule the multitude of appointments that accompany a diagnosis of lung cancer. Treatments such as radiation therapy which requires many visits can be difficult to balance with work. If you choose to receive care in another area of the country or are involved in a clinical trial out of state, scheduling can be easier if you don't have to juggle treatment with your job. Some people find they are able to eat a healthier diet and exercise more often if they aren't exhausted from trying to work during treatment. If you are not working, you won't need to fret and panic every time you experience a new symptom or side effect, wondering how it may affect your ability to work. If you are receiving chemotherapy and have a low white blood cell count (chemotherapy-induced neutropenia) it is easier to avoid infections if you are at home and away from people who may cough or sneeze near you. Work can serve as a distraction, keeping you from thinking about your cancer and what it means. If you get a lot of support from your co-workers, work can be a supportive environment which could help you cope. One study found that "cancer-related post-traumatic growth," that is, the way that cancer changes people in good ways, was greater for those who were able to work during treatment. As an employee, you have rights related to cancer, but those rights can vary depending on the size of the company you work for and where you live (as state laws differ.) Before talking to your employer or supervisor, become familiar with your company's policies regarding sick leave, as well as what the laws state. The Americans with Disabilities Act is a law which protects workers against employment discrimination based on disabilities such as cancer. People who work for a company with at least 15 employees must receive "reasonable accommodations" which allow them to perform their job duties. It's important to note that in order to be covered under this act it's required that you disclose your diagnosis to your employer. What Should You Know About Reasonable Accommodations? Flex time, or adjustment in work hours. Changes in your job duties due to physical limitations - for example, limiting lifting to a few pounds if you have had lung cancer surgery. The ability to telecommute if possible with your job, to avoid exposure to infectious diseases. Permission to talk on the phone or to email your oncologist if personal calls or email are otherwise prohibited at work. Periodic breaks to take a medication or rest. Modified office temperatures (for those who constantly feel cold during chemo). Closer parking access to reduce walking distance. The FMLA offers job protection to employees who work for companies with 50 or more employees. The FMLA allows you to take up to 12 weeks of unpaid leave during any 12 month period and guarantees that you will continue to get benefits such as health insurance. In order to receive this benefit you have to have been employed with a company for at least one year and have worked at least 1250 hours. Caregivers of someone with cancer may also qualify for FMLA if they meet these requirements and plan to return to the workplace when the leave is done. Applications for FMLA are done through your employer, often through human resources. You may be required to bring a letter from your oncologist certifying your diagnosis and plans for cancer treatment. Your employer also has a right to have a consulting oncologist evaluate your request. Employers may require a fitness for duty certification completed before allowing you to return to work after your leave. Make sure to review your FMLA information carefully, including how it may affect your sick time, and keep paperwork you complete in a safe but accessible place should you need it. When Should You Consider Disability? Nobody likes to think that they won’t be able to resume their prior level of activities during cancer treatment. But the truth is that many people with lung cancer will be unable to return to work after treatment. First, check on any private disability insurance or employer related disability benefits you may have. You may feel like it is too early to file for disability, but if you think you may need it, consider this early on as the application process can take several months. Federal benefits include Supplemental Security Income (SSI) and Social Security Disability Insurance (SSDI). This article can help you learn the difference between SSI and SSDI, and decide which is best for you. Here are some tips on how to apply for Social Security Disability. You don’t need to major in math in college to learn that cancer is expensive. At the same time as costs escalate due to co-pays and deductibles (not to speak of transportation costs, travel costs, etc.) most people with lung cancer are unable to work, at least to the degree they did prior to cancer. Keep careful records and make sure to take advantage of tax deductions for people with cancer. 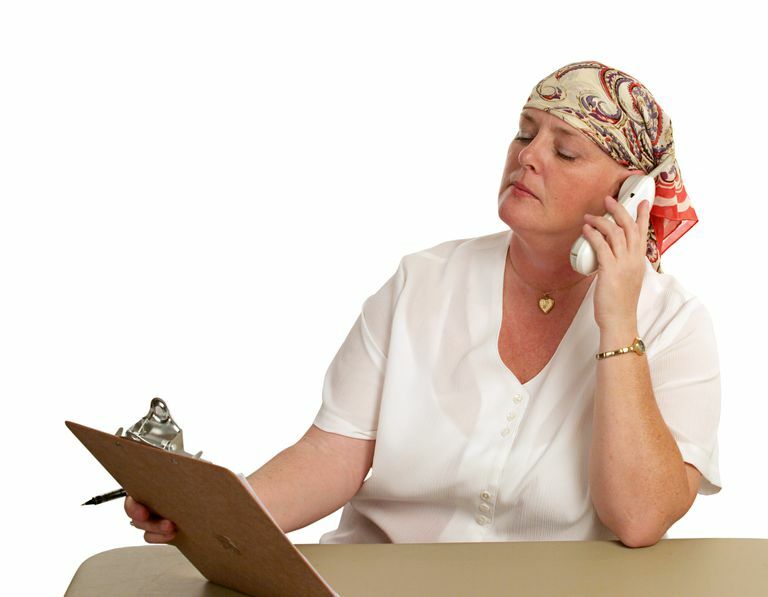 Here are some tips on where to find financial help for cancer patients as well. Sometimes it can take some creativity to balance your budget. Your oncology social worker will likely have some suggestions, and many of the lung cancer organizations may be able to provide direction as well. If you're low on ideas, having a friend host a cancer fundraiser is one way of not only improving your finances but giving your friend a concrete way in which she can help you during treatment. Thankfully, there are now many resources available which can help people make the difficult decision about whether to work during cancer treatment. In fact, the non-profit organization Cancer and Careers is devoted to helping people with these decisions as well as helping you know your rights. Before saying anything to your employer, become familiar with your company's policy regarding sick leave and review your rights as an employee. Many people find talking to their employer frightening. Every employer is different, though many employers are very supportive of their employees with cancer. Prepare what you plan to say ahead of time. It's best to be able to clearly state what you will need and not try to be a hero. It's usually much easier to say that you will be able to work more than you expected rather than less. It can be good when you talk to your supervisor to also note that things may change. It's hard to predict exactly how you will feel during your treatment and what side effects you may experience. After reviewing your rights and considering the pros and cons of working during cancer treatment, there are several questions which you should honestly consider. Does your oncologist believe you will be able to work? How will you fit your appointments into your work day? Can you schedule your chemotherapy infusions for the end of the week in order to have the weekend to recover? Does your job add or remove stress from your life? How would your income change if you take time off of work? Planning ahead and talking openly to your employer will likely decrease the chance that you will experience discrimination. If you do note discrimination, many of these issues can be resolved with a good conversation. Your oncologist or oncology social worker may be able to help with the process as well. If things are still not changing, you may wish to check out the resources available through the organization Cancer and Careers. If all else fails, some people will need to file a complaint. Many people find the question about working during cancer treatment a non-question. It can be difficult to work while balancing symptoms and treatment. Others, however, are able to continue with their job and find working helps them cope with their diagnosis. There isn't a right or wrong answer, and the decision is very personal. The important thing is to make the choice which is best for you alone. Finally, know your rights, and speak up if those rights aren't respected. If you have a hard time (or feel guilty) speaking up, consider that you are setting an example for others who may be diagnosed with cancer in the future. Cormio, C., Muzzatti, B., Romito, F., Mattioli, V., and M. Annuziata. Posttraumatic Growth and Cancer. A Study 5 Years After Treatment End. Supportive Care in Cancer. 2016 Dec 24. (Epub ahead of print). Kim, Y., Yun, Y., Chang, Y. et al. Employment Status and Work-Related Difficulties in Lung Cancer Survivors Compared with the General Population. Annals of Surgery. 2014. 259(3):569-75. Nekhlyudov, L., Walker, R., Ziebell, R., Rabin, B., Nutt, S., and J. Chubak. Cancer Survivors’ Experiences with Insurance, Finances, and Employment: Results from a Multisite Study. Journal of Cancer Survivorship. 2016. 10(6):1104-1111. Stergiou-Kita, M., Grigorovich, A., Tseung, V., Milosevic, E., Herbert, D., Phan, S., and J. Jones. Qualitative Meta-Synthesis of Survivors’ Work Experiences and the Development of Strategies to Facilitate Return to Work. Journal of Cancer Survivorship. 2014. 8(4):657-70. Tevaarwerk, A., Lee, J., Terhaar, A., Sesto, M., Smoth, M., Cleeland, C., and M. Fisch. Working after a Metastatic Cancer Diagnosis: Factors Affecting Employment in the Metastatic Setting from ECOG-ACRIN’s Symptom Outcomes and Practice Patterns Study. Cancer. 2016. 122(3):438-46.